A mention in The Seattle Times this morning inspired today’s blog. The arrival of winter also means the arrival of snow geese on the Skagit Delta. A great spot for viewing the geese is the area near Fir Island, a nexus of agricultural fields and tidal wetlands that serve as a critical stop for birds along the Pacific Flyway. The cacophony of sound that results is akin to pandemonium. 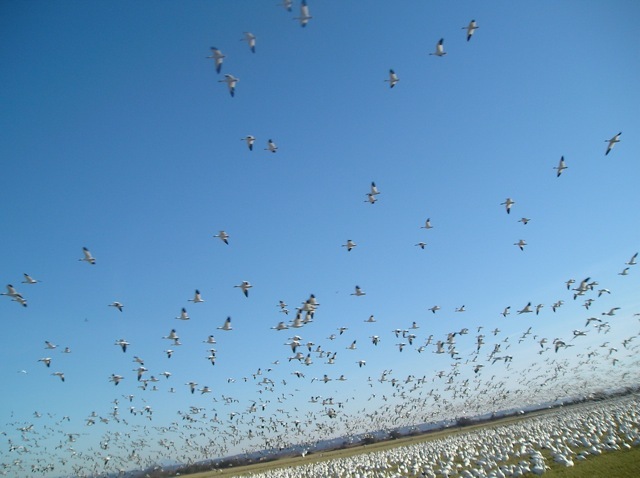 The Times notes: “The sound of a flock of snow geese can be heard from a mile away.” Listen to this audio recording of snow geese at the Skagit Wildlife Area (mp3). This audio file is copyright 2011 by Jeff Rice for the Puget Sound Institute and the Western Soundscape Archive. You are encouraged to download it and use it under the terms of the Creative Commons Attribution-Noncommercial-No Derivative Works 3.0 United States License. You will find more media such as this, as well as natural history and scientific information about the Puget Sound watershed in the forthcoming Encyclopedia of Puget Sound. Look for the encyclopedia online in the spring of 2012.